Jim kept his distance when he photographed this area of large hail that had broken off from a passing storm in north central Oklahoma. "The green color is due to sunlight interacting with the moisture of the storm—specifically the ice of the hailstones," he says. D3S, AF NIKKOR 24-85mm f/2.8-4D IF, 1/20 second, f/7.1, ISO 800, manual exposure, Matrix metering. By definition, weather is the state of the atmosphere, and that's a tough subject to capture. But the visual manifestations of the states of the atmosphere? Now you're talking photography. Weather phenomena are often beautiful, dramatic and eminently photogenic subjects. We spoke recently with Jim Reed, who's been chasing down weather for over 25 years. In fact, he's been referred to as a storm chaser, but he's not a big fan of the term. "I like to say I photograph the weather," is his low-key description of the pursuit of the "optical phenomena" associated with common and some not-so-common weather events—like rainbows, sundogs, cloud formations, hail curtains, rays of sunlight and more rainbows. "I think of optical phenomena as the visual ways in which weather conditions are presenting themselves to us to be photographed," Jim says. "They are essentially light interacting with water, the atmosphere and particles in the atmosphere. What I love about these phenomena is that they're very soothing and inspiring. I walk away feeling energized and hopeful." And he walks away with artful, intriguing, storytelling images of the variety of weather. If you want to do the same, Jim's got some advice—and it starts with safety. Simply, don't ever put yourself in danger in pursuit of a picture. The first of three views of a thunderstorm in western Nebraska. "It was special for the way the hail fell and for the rainbow appearing at the same time." What look like plumes of smoke are distant, isolated hail curtains. D800, AF-S NIKKOR 80-400mm f/4.5-5.6G ED VR (at 120mm), 1/400 second, f/11, ISO 400, manual exposure, Matrix metering. For this view, Jim took his camera off the tripod and zoomed in with his 80-400mm lens for some hand-held angles. This photo goes into a series Jim calls Atmospherics—"more art than editorial." D800, AF-S NIKKOR 80-400mm f/4.5-5.6G ED VR (at 310mm), 1/200 second, f/11, ISO 400, manual exposure, Matrix metering. The third photo in the Nebraska series highlights the hail. Jim didn't zoom in or move closer for this one—as the storm passed it came closer to him, and he zoomed out to make this extreme close-up of a large hail shaft. D800, AF-S NIKKOR 80-400mm f/4.5-5.6G ED VR (at 165mm), 1/400 second, f/11, ISO 400, manual exposure, Matrix metering. Weather images are available to all, throughout the four seasons, wherever you are. What you'll need to capture them is a versatile wide-angle zoom—over the years Jim's used several, including the AF Zoom-NIKKOR 35-70mm f/2.8D, the AF-S NIKKOR 24-85mm f/3.5-4.5G ED and the AF-S NIKKOR 24-70mm f/2.8G ED—and perhaps a long-ranging telephoto—Jim's choice lately is the AF-S NIKKOR 80-400mm f/4.5-5.6G ED VR—which comes in handy when he wants to keep his distance from wilder weather but still be in reach of photographs. "For me, though, 24 is the magic number," he says. "Anytime you want to photograph optical phenomena in association with a landscape, having 24mm is pretty handy." A tripod used to be an essential piece of equipment for him, and he still carries one, but its use has declined. "The change came with Vibration Reduction lenses and the ability to boost the ISO on my cameras to get faster shutter speeds." A morning thundershower in southeastern Montana, captured in a tripod-mounted shot. "The rainbow was extremely vibrant and lasted a long time—I have a whole series on this one." D3X, AF-S VR Zoom-NIKKOR 70-200mm f/2.8G IF-ED, 1/1000 second, f/13, ISO 400, manual exposure, Matrix metering. A late afternoon supercell thunderstorm produced a spectacular shelf cloud over the cropland of western Kansas. D800, AF-S NIKKOR 16-35mm f/4G ED VR, 1/100 second, f/10, ISO 2500, manual exposure, Matrix metering. "Weather can be stunning," Jim says, and this photo proves it. Chasing a tornado in south central Kansas, he arrived too late but then saw this double rainbow form up in front of him. N90s, AF NIKKOR 20mm f/2.8D with a circular polarizer, 1/125 second, f/2.8, ISO 100, manual exposure, Matrix metering. What I love about these phenomena is that they're very soothing and inspiring. I walk away feeling energized and hopeful. He also once relied on a circular polarizing filter to enhance a rainbow in an image, but that's changed also. "Couple the sensitivity of the cameras with image-editing software and I can basically add the filter effect or compensation afterward." Same for the graduated neutral density filter he once used. "In Camera Raw, in [Adobe] Photoshop, I can pretty much create my own ND filter." While Jim tries to get the hero shot in the camera, post-production is definitely part of the process for him. "I'd tell people to experiment with their settings to learn how to get most of what they want on the spot. I always try to get the best image in camera, so there's minimal post-production work, but I always shoot RAW because my goal is an on-screen image that matches what I saw. If post is needed for that, I'll do it gladly." There'd been showers earlier in this area of southern Minnesota, but late afternoon sun brought crepuscular rays, most often called sunbeams, which occur at dusk when the sun's at a low angle. D5, AF-S NIKKOR 24-70mm f/2.8G ED, 1/500 second, f/13, ISO 160, manual exposure, Matrix metering. Smoke from a western wildfire drifting into southeast Minnesota is partially responsible for the look of this photograph. "The sun reminded me of a child's red ball, so well-defined through smoke and the Belt of Venus, which is a phenomenon happening toward the end of the day or early dawn when particles in the air result in graduated colors in the sky." D5, AF-S NIKKOR 24-70mm f/2.8G ED, 1/125 second, f/10, ISO 320, manual exposure, Matrix metering. Jim took this photo by the light of the moon at 4:22am in central Kansas. His camera was tripod mounted to handle the long exposure. Enlarge the image and you can see stars in the sky. "I got lucky with the ground fog," he says. D3X, AF-S NIKKOR 24-70mm f/2.8G ED, 20 seconds, f/8, ISO 800, manual exposure, Matrix metering. 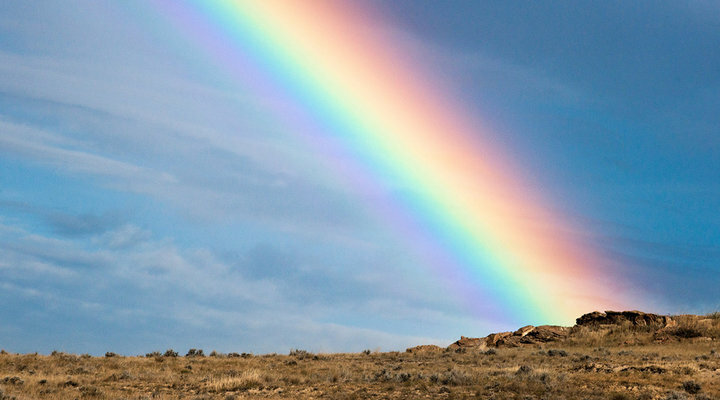 Rainbows might be the most popular weather-related subjects for photographers. In Jim's pictures, and in yours, they can be the main subject or part of the background, adding color, shape and eye-catching interest to a landscape that stands strong on its own. If you're looking for a rainbow, you'll need two things: rain and sun. "The ingredients are water droplets and sunlight," Jim says. "Just be outdoors at the right time and look around. I joke with colleagues: 'Rain and sunlight? We should issue a rainbow watch.' It's that simple." You do have to consider location, though. Jim advises that "to get a good, clean photograph of a rainbow you need an open space without distractions—no utility poles, power lines or cellphone towers—and that's getting tougher all the time. So wherever you live, get to know the locations that will give you clear, open areas, and when a rainbow alert makes itself known, be there. Preferably a slow-moving rainstorm followed by clearing and sun—that's your clue. The more you do it, and the more you learn, the better you get and the more fun it is." A storm in eastern Colorado was moving off when Jim captured these anticrepuscular rays, which you're most likely to see near sunrise or sunset when you're standing with the sun at your back. D3X, AF-S NIKKOR 24-70mm f/2.8G ED, 1/750 second, f/5.6, ISO 400, manual exposure, Matrix metering. Crepuscular rays in the early afternoon in central Kansas. "Anything in the atmosphere—moisture, dust or particulates in the sky—can interact with light and influence color," Jim says. N90S, AF NIKKOR 20mm f/2.8D, 1/125 second, f/2.8, ISO 200, manual exposure, Matrix metering. "This is in southern Kansas, at sunset. There was a lot of smoke in the atmosphere from a wildfire in Oklahoma. I heard that the smoke was so dense it was showing up on local radar. That was something worth taking a look at." N90, AF Zoom-NIKKOR 80-200mm f/2.8 AF-D, 1/2 second, f/5.6, ISO 100, manual exposure, center-weighted metering. Rainbows aren't the only photogenic subjects rainstorms can provide. "I always look for a shelf cloud associated with a thunderstorm, most often a strong thunderstorm," Jim says. "it's a feature on the leading edge of the cool air of the storm, and it looks like the old cowcatcher on the front of a locomotive. The winds shape it in conjunction with temperature change." If you have a radar app on your smartphone—and who wouldn't?—look also for a bow-shaped thin green line in the radar display. "That's precipitation," Jim says, "and it's the gust front—cool rain and cool air coming out of the storm. If you wait for the wind to pick up and the temperature to drop, things will be changing in the sky, and there's a good chance for some photogenic atmospherics." Be aware of not only nearby atmospherics, but also distant events that will affect them. "In the west recently we had a lot of wildfires, and the smoke eventually drifted into southeast Minnesota where I'd been shooting." Of course there's no shortage of visual and verbal weather predictors available online, so you can know when and where to look for weather-related photo opportunities. That's about it. Your camera, a few lenses, some basic weather information and you're pretty much set if you've got an adventurous spirit—and access to wide open spaces. It looks like a rainbow, but it's not—it's a sundog, and it's caused when sunlight is refracted as it passes through ice crystals in cirrus clouds. Jim photographed this one in New Mexico, but, he says "you can see one anywhere—it's just a matter of the air being cold enough at that atmosphere to support ice crystals. It's not easy to predict, but if I see cirrus clouds, I might think about watching for a sundog. In most cases, though, I see it as it's happening." N90, Nikkor 35-70mm f/2.8, 1/100 second, f/10, ISO 400, manual exposure, Matrix metering. "This thunderstorm in southern Minnesota put on quite a sunset show in terms of contrasts," Jim says. "It wasn't a severe storm, just one with a dramatic look: the sun filtering through and rain filtering the sun, creating pockets of light and dark sky areas and shadows on the ground. I call it a showcase for the dynamic range of my camera." D5, AF-S NIKKOR 24-70mm f/2.8G ED, 1/100 second, f/10, ISO 1000, manual exposure, Matrix metering. "This is pretty rare," Jim says. "These are noctilucent clouds—the highest clouds in earth's atmosphere, in the mesosphere, about 50 miles up. Too faint to be seen in daylight, they're visible only in twilight when illuminated by sunlight below the horizon level. I was teaching a workshop in South Dakota when we saw them." D3S, AF-S VR Zoom-NIKKOR 70-200mm f/2.8G IF-ED, 10 seconds, f/4, ISO 320, manual exposure, Matrix metering. See more of Jim Reed's photography at his website: jimreedphoto.com. Examples of Jim's award-winning weather photography are featured at his website, jimreedphoto.com, and on his Instagram pages at instagram.com/jimreedphoto. His images have been published in National Geographic, Scientific American and The New York Times, in addition to numerous other publications, and he has been a guest on The Weather Channel and The Discovery Channel. His book, Storm Chaser: A Photographer's Journey is widely available.